What are the key factors that female Air Force officers consider when deciding whether to separate from the active duty Air Force? How could Air Force policies and programs be improved to help address potential barriers and improve retention of female officers? Women are underrepresented among the Air Force's senior leadership compared with their representation among the lower ranks. One factor contributing to this underrepresentation is that women tend to leave the active duty Air Force at higher rates than men. This report documents the results of a qualitative study designed to better understand the factors that female Air Force officers consider when deciding whether to remain in or separate from the active duty Air Force. The study conducted a total of 54 focus groups with 295 female Air Force officers in the spring of 2016 from across 12 different Air Force installations. 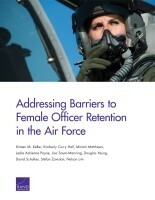 The report describes the key retention factors identified through these focus groups and provides recommendations for improving Air Force policies and programs to help address potential barriers and improve female officer retention. Family and personal life were a prevalent theme across the focus groups with female Air Force officers. Comments included statements about children, pregnancy, spouses, dating, and other issues related to officers' personal lives. Female officers also discussed issues related to their Air Force careers that affect their retention decisions, focusing primarily on three areas: career path flexibility, ability to cross-train, and civilian opportunities. Several factors related to work environment influenced retention decisions, including the importance of leadership, female role models, mentoring, gender composition, sexual harassment and assault, and long work hours or shift work. Other key retention factors associated more broadly with an Air Force career included Air Force benefits, Permanent Change of Station, deployments, and force reduction. Focus group discussions also sought to gauge female officers' opinions about two recently established Air Force programs and policies: the updated maternity leave policy, which extended maternity leave to 12 paid weeks and deferred fitness tests and deployments for one year after the birth of a child; and the Career Intermission Program (CIP), which allows for inactivation and transfer to the Individual Ready Reserve with partial pay for up to three years before returning to active duty. Participants said the new maternity leave policy is a step in the right direction to support women in the Air Force but were mixed on whether this new policy might influence female officers' decisions regarding retention. Understanding and awareness of the CIP varied. Most female officers were glad the CIP exists and thought that it could be beneficial — but most also believed it would have little effect on retention and were skeptical that it would not have negative career effects. Expand subsidized child care options and available CDC hours. Increase paternity and adoption leave. Ensure women are provided a designated nursing facility or a private room for pumping. Ensure spouse support programs and initiatives are inclusive of male spouses. Consider a couple's parental status and needs in deployment policy. Identify an interservice liaison to coordinate cross-service spouse assignments. Provide tools for educating precommissioning officers on career field options, including differences in locations, deployments, spouse compatibility, etc. Provide a structure and related policy for allowing more cross-training opportunities. Offer a separate technical career track. Expand and raise awareness of the CIP. Provide flexibility for transferring into and back from the Air Force Reserve. Provide education for leaders on creating positive work-life balance. Provide education for leaders on prevention of a sexist work environment. Provide opportunities for women-focused panels or forums. Explore options for reducing the frequency of PCS. Explore a more decentralized assignment process to allow officers more autonomy in assignments. This research was cosponsored by the Office of the Assistant Secretary of the Air Force for Manpower and Reserve Affairs and the Air Force Deputy Chief of Staff for Manpower, Personnel and Services and conducted within the Manpower, Personnel, and Training Program of RAND Project AIR FORCE. Keller, Kirsten M., Kimberly Curry Hall, Miriam Matthews, Leslie Adrienne Payne, Lisa Saum-Manning, Douglas Yeung, David Schulker, Stefan Zavislan, and Nelson Lim, Addressing Barriers to Female Officer Retention in the Air Force. Santa Monica, CA: RAND Corporation, 2018. https://www.rand.org/pubs/research_reports/RR2073.html. Also available in print form.